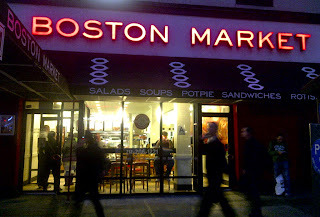 Little Ms. Piggys: Blast from the Past: Boston Market! Now that fall weather has officially arrived, I've been feeling the call of my ultimate hot comfort meal: a simple rotisserie chicken dinner with all the tasty sides and gravy mmmm. Where to go to satisfy my craving? 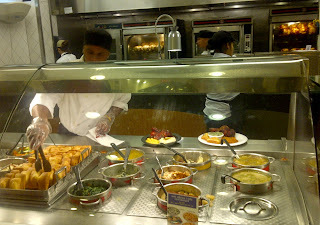 None other than Boston Market of course! 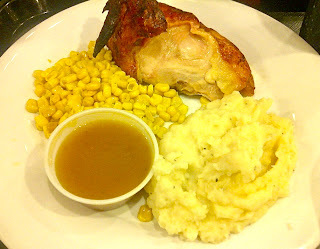 My favorite comfort meal: quarter chicken with large helping of buttery mashed potatoes and corn. Dont forget the extra gravy! Growing up in suburbia Jersey, nothing excited me more than seeing my mom bring home dinner in Boston Market bags. And to be honest, since I'm not a big turkey fan, a Boston Market chicken usually ends up on the table for me every Thanksgiving (don’t judge!). 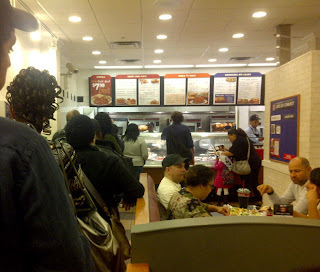 Thus, on this dire quest to fulfill my longing for chicken, seeking out a Boston Market in the city turned into a must do. I know what you're thinking - there must be some other option in this city that serves a fabulous rotisserie chicken dinner. While that may be true, I was really looking for my chicken AND the nostalgic feelings of home and my childhood. So looks like you’ll just have to bear with me as I wax poetic about my love for Boston Market. I mean, don’t you guys just have those days where you crave Olive Garden and Cheesecake Factory (no need to deny – I know its true!!)?? So, now that I’m done making excuses, off I go to 23rd St and 8th Ave! Behold...the glory of Boston Market! Lo and behold - I'm apparantly not the only one with a craving for Boston Market! Look at the line of people in front of me! After getting over the shock of what a crush it was at Boston Market, I took a look around and realized, hey this place actually looks shiny and clean! The seating area looked tidy and organized, the ovens and display cases looked well cared for, and the menu signs were updated into appealing fonts and designs! As I approached the front, it was comforting to see that the layout of the food looked just like it always did at my hometown Boston Market! I went with my usual order of quarter chicken white meat meal with sides of mashed potatoes, corn, cornbread, and a large side of gravy (first pic at the top)! My buddy R (who happens to love Boston Market as much as I do) also got the quarter chicken meal but with mac n’cheese and mashed potatoes. New item alert! After perusing the sides, R and I noticed that there were a couple new choices available including additional veggie options and, most importantly, LOADED MASHED POTATOES with cheese, bacon, sour cream, and chives. This was not something we could pass up so let’s add that to our meal along with GIANT movie theater size fountain sodas (it’s ridiculous how big they were yet so satisfying to sip). 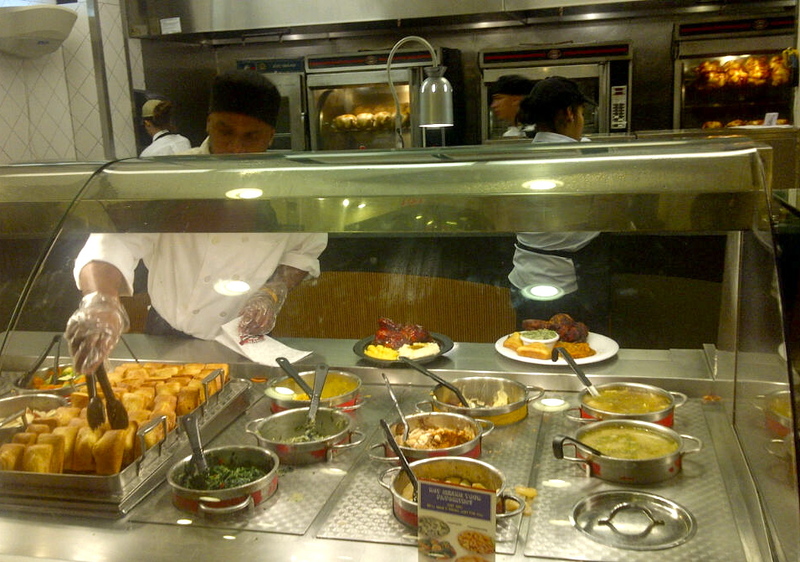 Also something new – if you were staying to eat, your meal came served on actual dinner plates! R's meal with the loaded mashed potatos on the side! Look at the loaded goodness!! 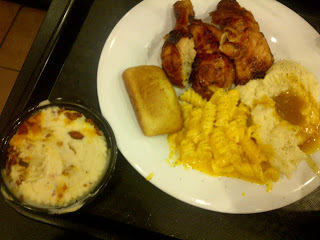 All in all, my meal at Boston Market totally hit the spot and satisfied my childhood heart. The quality of the meal was just as good as I remembered and the new side options with dinner service on a plate were nice new additions. After stuffing myself past any level of comfort, I happily rolled myself home and promptly into jammies and bed. 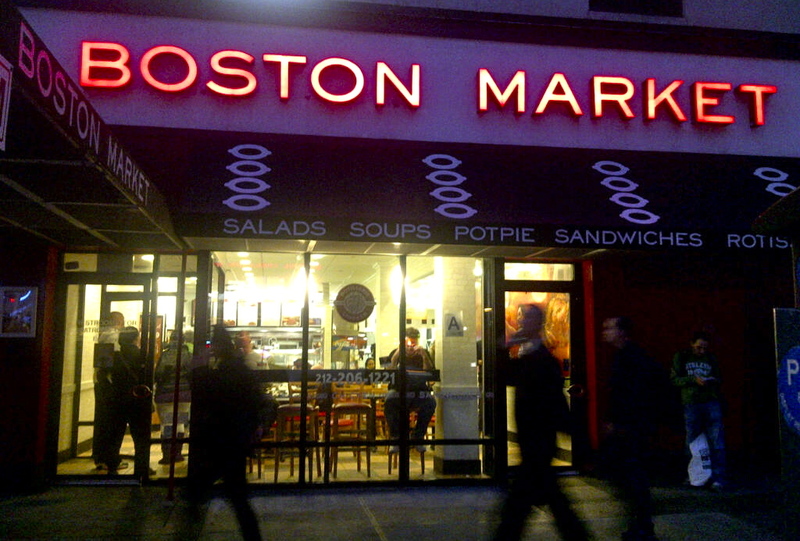 If you were a fan of Boston Market in your youth, definitely give the one in the city a try. It won’t disappoint!